The attendance terminal is for the most demanding applications. Depending on the version, it enables both contact and contactless ID media to be scanned. 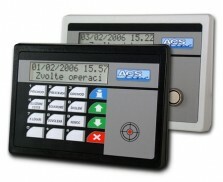 This terminal is designed for a data gathering within the attendance system, door opening according to access rights, peripheries control and many other functions depending on setting. User-defined descriptions of individual keys can be defined on the universally designed membrane keyboard for quick selection of interruption. The activity type is selected by pushing a single button – direct selection or by selecting a numeric code from a vast list. Individual operations are filled in through a computer and can include various types of arrivals and departures, opening or closing of doors, turning on or off of a connected appliance, etc. 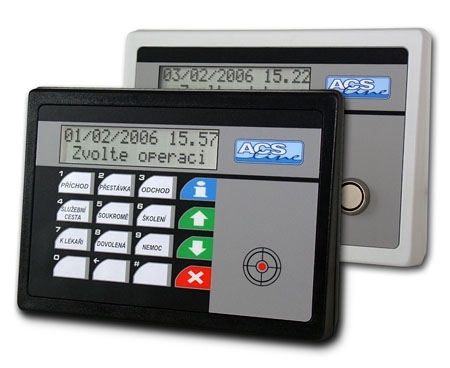 Door control can be performed on both sides with the use of an EDK scanner. When a code is read and verified, the event is registered into an internal memory and defined operations are performed. If there is a door contact connected, the module enables signalization and monitoring of door status (forced opening, not closing). The display of the terminal shows the current time and date, selected operations, names of people passing through and other operational information. All operational characteristics can be set within a clearly organized menu or distantly from a computer. A rain shield or anti-vandal case can be ordered for outdoor use, both in stainless steel.